During August and September 2011, I (Island Dreams' owner Ken Knezick) conducted a group of 28 scuba divers to North Sulawesi, Indonesia. Our first five nights were spent at Kima Bajo Resort & Spa, diving in Bunaken Marine Park with Eco Divers. The second half of the trip was based at Lembeh Resort, where we dived Lembeh Strait with the exellent guides of Critters@Lembeh. The photographs in this gallery were made during the first, Bunaken, portion of the trip. 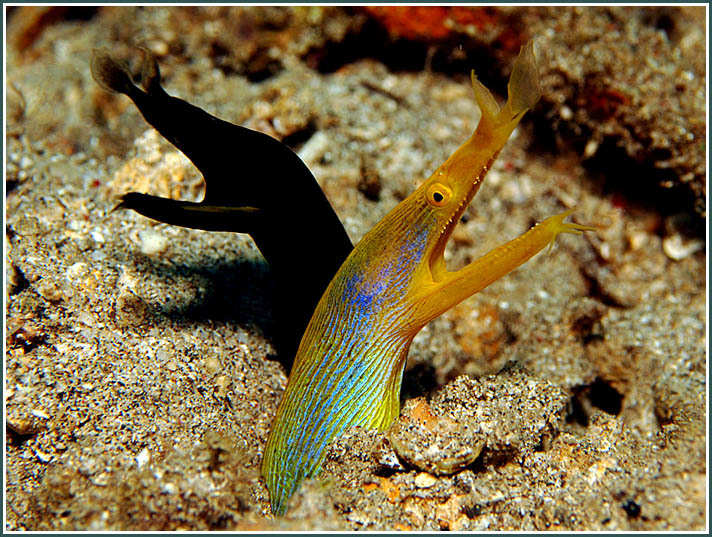 As you may know, Lembeh Strait is famous for its muck diving. The critters there are great, but often the background is nothing more than black sand or muck. The value of Bunaken diving is that you can find many of the same creatures, but often with a more healthy background. Bunaken also offers the option of good blue water coral reef diving. The purpose of this gallery, then, is to help you to evaluate the difference between the diving to be enjoyed at Bunaken and Lembeh. Hopefully you will be inspired to experience both areas. Copyright Ken Knezick, Island Dreams -- All rights reserved. Do not copy or reproduce these images without prior explicit written permission.